Polycarbonate Thermal Glazed Skylights – The polycarbonate sheet is tough and impact resistant being more than 250 times tougher than float glass and 30 times more than acrylic sheets. These double or triple glazed sheets are UV stabilised and have high thermal insulation properties making them very energy efficient. Hi-Flex Skylights – These are especially installed where there are obstructions outside and a conventional skylight cannot be installed at the exact location required. The flexible shaft can be moved around obstacles and the mirrored inside of the shaft ensures that there is no decrease in the quantum of light. The shaft is made from UV stabilised polyester film or highly reflective aluminium. 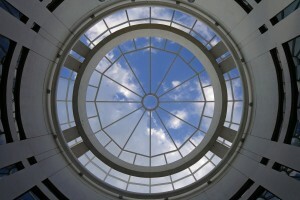 Circular Skylights – Circular skylights add a touch of class to your internal decor. These are available in double and triple glazing to increase energy efficiencies. The advantage here is that they can be fitted to a square or circular base which can be either colour matched aluminium or zinc. These can be fitted to almost all types of roof profiles. The material absorbs harmful UV rays to almost 99% levels. Fire Rated Skylights – These custom made skylights are especially manufactured for places that are prone to bush fires. It is made of toughened glass and is ideal for setting up on a flat roof like warehouses, commercial buildings and schools. It is strong and durable and does not discolour over a period of time. Since it is made of glass, it can be installed on either side and affords a clear view of the sky. There are a lot of other versions and models of circular skylights and other custom made skylights and if you want the top high quality ones, get in touch with Custom Skylights. Our skylights are a source of natural light and designed to give a real feel of the outdoors. We are an Australian company with manufacturing facilities at Bayswater manufacturing all components of our skylights including domes, bases and flexi-shafts. For any type of Skylights to match your specific needs, give us a call.